Date of issue: December 9, 2005. Adyrna is multistring musical instrument of ancient origin. It was popular among ancient Turkis and Kypchaks. Researchers marked its similarity with a bow. 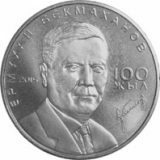 On the right side of the coin in the center there is an image of old man playing adyrna and inscription two line legend “500 TENGE” indicated face value of the coin. 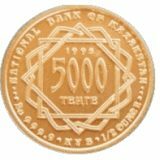 Along the circumference there are the legend “Republic of Kazakhstan” on the mat part and relief legend ” Ag 925 24 gr.” on the bright part indicating production metal of the coin, its standard and weight. 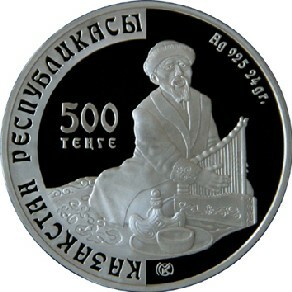 Trade mark of Kazakhstan Mint is represented in the lower part. 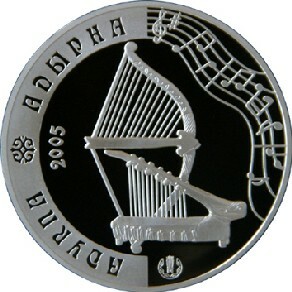 The reverse side of the coin shows relief image of two types of Kazakh national musical instrument – adyrna and conventionalized image of stave. 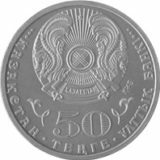 In the left part vertical figure “2005” indicates the year of coinage. To the left along the circumference there is a legend “ADYRNA” on the mat surface. Words are divided by element of national ornament. Legends and element of national ornament are depressed.